Tip of the old scrub brush to Unreasonable Faith and earthaid. You couldn’t get fiction like this published. Republicans in Maine voted to scrap the Republican platform and write a new one — not enough unholy discrimination in the old one, too much Eisenhower, too much Lincoln, or something like that. The convention spilled out into a local middle school for some of the platform writing shenanigans. In one 8th grade classroom, the Maine Republicans found something they objected to, something they don’t want taught to 8th graders: The U.S. Constitution. Pharyngula has the story and comments here. ThinkProgress has more gory details here. Portland (Maine) Press-Herald story here. Bangor Daily News story here. The Republicans were particularly incensed by a poster showing a collage used to open a project assigned to the Portland 8th graders. The 8th graders make poster collages elaborating on the Four Freedoms speech of Franklin Roosevelt, and the accompanying posters by Norman Rockwell. Norman Rockwell. You know. The guy who started his professional career as art director for the Boy Scouts of America . . .
“Brainwashing” the Republicans called U.S. history. Brainwashing. Remember when Republicans used to complain that we can’t jail flag-burning protesters? When did those guys get kicked out of the party, and who are these new thugs? When did it become the Re-Poe-blican Party? When did they take up the Blackshirt tactics? C’mon, Republicans. Come back to America. Repent now. And — as for us Texans? This is the stuff Don McLeroy wants to see happen in Texas social studies standards — vandalism of the U.S. Constitution and American law and tradition. As a Scouter, as a teacher, as a fan of the U.S. Constitution, I’m concerned. Should I be scared? “I saw nothing in the room — and nobody pointed out anything in the room — that appeared to give a more balanced view,” [Knox County Republican Party Chairman William] Chapman said. Maybe everyone should be scared. Hmmmmm. Ken County, Maine, Republicans offer rewards to people who rat out others who vandalize campaign signs. How about they extend that to rat out the Republicans who vandalized Paul Clifford’s classroom? You know, in the interest of free speech and all . . .
Maine Public Broadcast Network coverage of the story — Republicans have apologized. The main story notes that collages from Mr. Clifford’s classes will go on display at the Portland Public Library on June 4. Watch for Tea Party protesters. 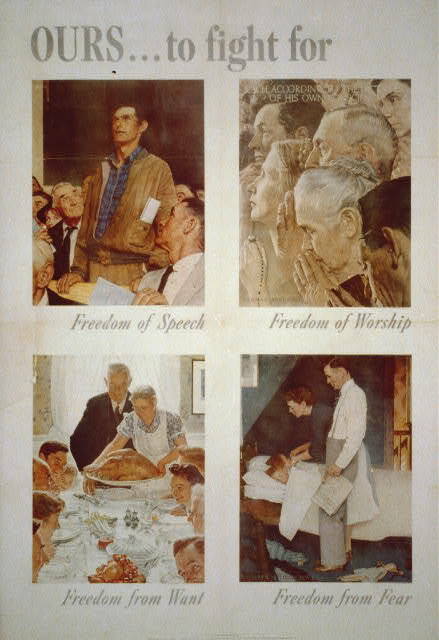 Norman Rockwell, poster of his paintings on the Four Freedoms (Library of Congress image). This is part of what the Maine Tea Party Republicans objected to. You are currently browsing the archives for the History Revisionism category.